More moves to help homeowners suffering through our crumbling concrete crisis. 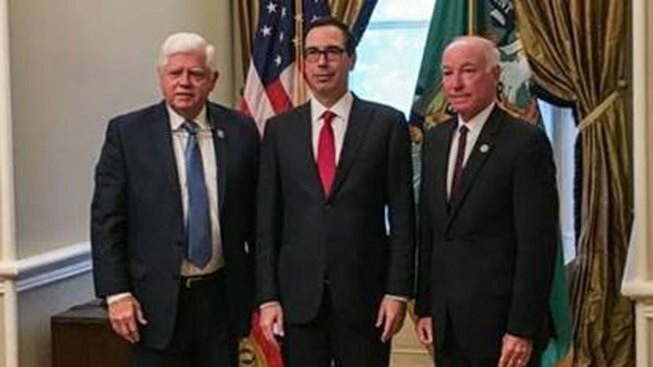 Just days after Governor Dannel Malloy floated the idea of issuing bonds to help research the problem and assist homeowners, Congressmen Joe Courtney and John Larson report they met with Treasury Secretary Steven Mnuchin to discuss relief for people in north central and eastern Connecticut on Monday. The group discussed the possibility that homeowners could deduct the cost of replacing their concrete foundations on their federal income taxes. Hundreds of homeowners have filed complaints with the state saying their foundations are failing underneath their homes, and the cost of replacing them can often be upwards of $200,000. There are legal issues the federal government would have to sort through on this, since there is relief for people suffering a sudden casualty loss, but not longer-term damage. The Congressmen emphasize they have said from the start there will not be one silver bullet to help homeowners, but this could be part of the solution.